There are dozens of keyword research tools available, but few are as popular as Google’s keyword tool. Google’s Keyword Planner tool offers marketers and advertisers plenty of valuable keyword data, such as related search terms, ad group ideas, keyword suggestions, keyword trend data and more. However, for all its power and versatility, there is one major drawback to Google’s keyword tool: you need an AdWords account to use it. That’s why WordStream’s free Keyword Suggestion Tool is an ideal, open alternative to Google's Keyword Planner that absolutely anybody can use, completely free of charge. Whether you're looking for keywords for SEO or PPC, our Free Keyword Tool has you covered. If desired, choose your industry and country to further refine your keyword search results. To get the full list of keywords, just enter your email and we'll send them all to your inbox, completely free of charge. To get even more keyword data to help you plan and execute your paid search marketing campaigns, you can connect your Google AdWords account through a secure, one-time OAuth connection, and we'll provide personalized results tailored to your specific business and AdWords account history. Opportunity Score – This proprietary metric helps you easily identify the keywords with the highest potential to drive results, so you can prioritize your search marketing efforts. Competition Level – Understand how competitive your keywords are; a higher competition level usually corresponds to higher costs per click. CPC – An estimate of the average cost per click of each keyword in Google AdWords. Used in concert, WordStream’s Free Keyword Tool and the Google Keyword Tool (now called Keyword Planner) are an excellent combination for advertisers seeking to exert greater control over their keyword advertising strategies and see greater return on investment from their advertising budget. One element of keyword research that many advertisers overlook is building a negative keyword list. Just as relevant keywords are crucial to the success of any PPC campaign, so too is a negative keyword list, which tells Google which terms your ads should not appear alongside. This reduces wasted budget on irrelevant or non-converting keyword searches. Adding negatives to your AdWords account is straightforward, and can be done via the Keywords tab of the main AdWords interface. 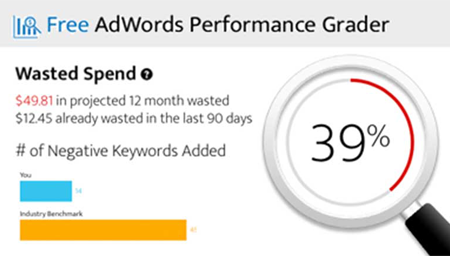 As you can see, AdWords allows you to add negatives at either the ad group or campaign level. What this interface doesn’t offer, however, is a list of recommended negative keywords to begin with. Although this information can be accessed via the Keyword Planner, WordStream’s free Negative Keyword Tool has helped thousands of advertisers avoid wasting precious advertising dollars. As before, you’ll be presented with a selection of keywords based on your original query. However, while the Keyword Suggestion Tool offers keywords you may want to consider adding to your account, the Negative Keyword Tool provides recommendations of keywords you should exclude from your account as negatives, or keywords that are irrelevant to your business. In the figure above, we’ve added several negative keywords to our list already, such as those associated with specific construction companies (signified by the inclusion of “llc” in the query), construction cleaning and engineering services (neither of which are services offered by our example advertiser), and keywords associated with the state of Florida (also irrelevant to our example advertiser). This negative keyword list can be exported from WordStream and uploaded to your Google AdWords account in mere moments, making it a simple, fast, and intuitive way to quickly and easily identify negative keywords that could be costing you money.